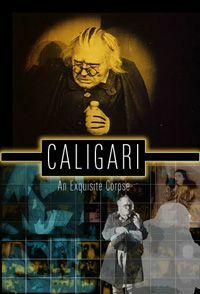 Eleven composers collaborated in Exquisite Corpse fashion to produce two brand new soundtracks for the German Expressionist Classic The Cabinet Of Dr. Caligari. The film with the new soundtracks is available for free download from archive.org under a Creative Commons license (Attribution-Noncommercial-Share Alike 3.0). My approach to film music has been shaped by the soundtracks of "Clockwork Orange" (Walter Carlos), "American Beauty" (Thomas Newman) and "Owning Mahowny" (Grassby-Lewis, Jon Hassell, Tim Norfolk), music of distinct character that works beautifully with the film, but is of sufficient interest to provide a fulfilling listening experience on its own. What I wanted to avoid was writing the traditional "incidental" music. Act 1 has a lot of work to do. In roughly 10 minutes it establishes a narrative and setting, introduces the major characters and frames an array of opposing themes that appear throughout the film: light vs. dark, young vs. old, good vs. evil, control vs. powerlessness. The five scenes of the act are varied and distinct from one another, so I wanted each movement of the music to reflect that individuality. As discrete, stylistically distinct pieces, each is concerned with the the most prominent quality of the scene. The spooky theremin-style sound in Scene 1, "In the Garden", echoes the ghostly appearance of Jane, as she floats spirit-like past the narrator. Scene 2, "Appearance of Evil", introduces the villainous Dr Caligari with heart-racing anxiety. In Scene 3 "My Friend Alan" the ill-fated lad is presented as young, buoyant and idealistic by an up-beat melody and percussion. The agonized and slow moving Scene 4, "Permitting Murder" conveys the near comical frustration of the impatient Dr Caligari, rendered momentarily impotent by the archetypically inefficient bureaucracy. Scene 5, "Prescient" paints an ominous picture of the evil to come, not yet apparent to the cheerful, sun-washed crowd. I watched the film sans any sound a few times, then watched Act 5 a number of times. I wanted to do something "trip hoppy," kind of atmospheric or ethereal and while there are some drony moments, the track turned out more dramatic to match the breakdown of our anti-hero, Dr. Caligari. So you have some strings going nuts, some atonality and jazz chords.... Most of the work was done with the Roland GR-30 Guitar Synthesizer. If Caligari was a short story, Act VI would be the plot twist, the place where expectations are dashed, and the whole story is redefined. Through the first part of the act, I worked to build a feeling of vague dread and unease with a looped sting pad, angular bassline, asymmetric rhythms, skronking woodwinds, edgy slide-wah guitar, and the atonal Caligari piano theme. When the action finally returns to the garden wall outside the asylum and all is revealed, I wanted to up the feelings of dread and unease to disassociation, paranoia, horror, and fear. To do this, I used a bed of high-pitched electronic sound, underlaid with gently ascending loop-drones of guitar feedback and overblown bass clarinet harmonics. I added a creepy, wibbling, psycho-blues alto sax solo played in the key of metaphysical distress to up the discomfort factor even further. At the very end, I reiterate the atonal Caligari piano theme, to underscore the irony of the reversal of fortunes experienced by Caligari and Francis. To get the feel I wanted, I decided to go with a mixture of acoustic, electric, and electronic instruments, and take the style of music outside of the period of the film to include contemporary free and electronic musics. Alto and soprano saxes, bass clarinet, laptop and electric guitar parts were cut from previously recorded solo improvisations of my own, and collaged into final form using Rezound and Ardour with xJadeo, open source audio editors + video channel running on Linux. Piano, electric bass, and drum parts were created from algorithmically generated MIDI data voiced using general MIDI and GigaPiano sample sets. Chronologically recorded after I'd finished work on Act IV, I decided that - in the spirit of the project, I should attempt to conjure an entirely different piece of music, rather than reiterate themes established in Act IV. I also elected to use a completely different tonal palette - a Yamaha MU5 Tone Generator which had been gathering dust for several years. The idea of commencing the piece with the sound of scratchy, crackling ancient media which would then blossom into the fully restored glory of the digital era was, admittedly, a thin conceit, but got things started. The dream-like (nightmarish?) mood of the whole film influenced the use of a slightly sinister music box theme, moving on through other instruments grouped with it on the sound module. In other scenes I went for a more light-hearted feel, whilst suggesting the protagonist's butterfly-like attention span by interrupting the flow with sounds from the street below. The sound of Caligari himself was a synchronistic happenstance find whilst wondering around the high numbers of the sound module's midi mapping. "String noise", it's supposed to be - sounded sufficiently eerie for my requirements: in it went. Considerable pitch-shifting was used to suggest his mood swing(s), especially as he hatches his cunning plan. this is incredible. Awesome. My new favorite CT tune. Prior to the Caligari project, my film scoring experience was limited to a number of short films done both by myself and by other student filmmakers in the early 1980's. An important difference, though, was that Caligari was the first time I ever attempted to score to an existing image, rather than fitting the image to the music. As several of the other composers noted during the process, it's harder than it looks! My plan of attack was to first watch my segment several times, noting the overall mood and the dynamic progression throughout the scene. I plotted the onscreen events out onto a long timechart, notating significant visual cues, the times at which they occured and then scrawling notes all over the timechart regarding moods, textures and possible instrumentation. As Act III seemed to me to be characterized more by a vague mood of apprehension and angst rather than by specific actions, I chose to build my piece around the idea of a bed of unresolved chords and languid progressions with circular movement, motifs that would rise and build but never actually get anywhere, thus winding the spring for the climactic events of the following acts. Instrumentation was limited to various gongs, cymbals, wrenches, bells and chimes with cello and an old Yamaha 'Portasound' keyboard. I had originally done more Foleying, but most of it was mixed out of the final version, as it seemed to clutter the mix; the exception is the babble loop heard when the accused killer is being questioned. Recording was split between a Tascam 488 analog 8 track recorder and a desktop PC running Sonic Foundry's Acid v. 1.0, which is almost old enough to have been used on the original Caligari. Of what was I thinking? Many times over the years, people have told me your music sounds like it should be the soundtrack to some weird sci-fi film, and sometimes, this was even meant as a compliment. So I really wanted to do something good for this project - just what my music had been waiting for, so it might seem. I had a bit of luck - I won a copy of Acid Pro 6 from those nice people at AcidPlanet/Sony just as I was thinking about how to sync my sounds with the images from the film, and without it, I'd probably have been stuck. The composing was done, often as not, by improvising along with the film, scene by scene, and then editing and recomposing and cut'n'pasting like crazy, and then getting right down to a pains-taking process of lining up the notes to the action. Most of this was generated by guitar, ebow, reverb, delays, loops (Digitech JamMan in real time, then edited with Sonic Forge). I planned not to use naturalistic Foley sounds at first, but some gradually crept in, including the funeral bells (chiming 13), and the creaking doors. My son, Michael, added some drums at appropriate points, and hopefully, viewers will jump out of their respective skins at just *that* precise moment. The bit which sounds like someone's finger tapping on one end of a guitar lead plugged-in to a large reverb unit is indeed just that. I wish I could say that the lengthy glissandi sections were recorded on strings stretched from one end of my kitchen to the other, or better yet, a Long String Instrument, but it's just multi-tracked, spirit of Gong, screwdriver-on-guitar-string with added processing. The chase sequence, as scored by the Gang of Four - who can resist? a mixture of processed guitar and synthesizers, plus a few bits of canned foley. I've always loved the film _The Cabinet of Dr. Caligari_ as a commentary on reality, madness, unreality, branching universes, and control over oneself and others. I watched the film in its entirety four times on consecutive nights, then another twenty to thirty times left on in the background while I did other things. I reviewed Act VI of the film taking timemarker notes of each action in the film. I then decided on what fit the events of the film, looking for the movements of the characters and what would work to repeat. Setting up my Todd McFarlane action figure of Dr. Caligari, I created themes for Dr. Caligari, Francis, and Jane, and various events as I thought fit using a Raagini Pro tanbura sampler, a Moog Etherwave Pro theremin, and a Zeta Crossover electric upright bass processed through the effects pedal chain, capturing them in the looper pedals as I felt I had the correct sense of the piece. I played the six themes and captured them in three loop pedals, two per pedal. I then wrote notes as to which themes to play at what times. I brought up the samples as needed, playing sections live on Chapman Stick intermittently. I did three run-throughs for practice, then did three takes with the recorder running. Next day I chose the one that I felt came the closest to the appropriate dynamics and pacing throughout. I took the night off, came back the next evening to review the choice, and was still convinced I'd chosen the best one. No overlays were added to the track from the live recording.